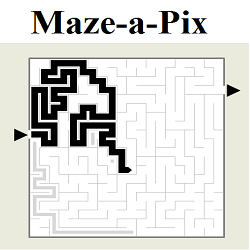 Maze-a-Pix are exciting Picture Logic puzzles that form whimsical pixel-composed pictures when solved. Based on the classic maze puzzles, this original Japanese adaptation offers the ultimate mix of maze solving, art and fun while providing solvers with many hours of mentally stimulating entertainment. Maze-a-Pix puzzles come in B and W and color, and are available in many sizes taking anything from five minutes to several hours to solve. However, make one mistake and you will find yourself stuck later on as you get closer to the solution.